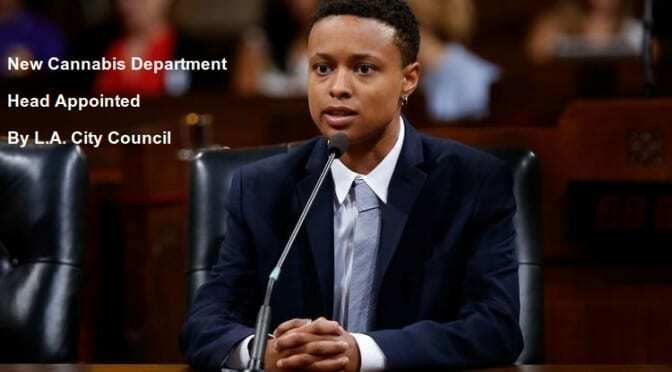 Last week Wednesday, the Los Angeles City Council elected someone to supervise its new Department of Cannabis Regulation. Backing Mayor Eric Garcett’s choice for the job, the vote came as state officials are creating a legal regulatory environment for the recreational weed market. Former coordinator for California’s Drug Policy Alliance will head the new division. Cat Packer will have a five-member Cannabis Commission to help and advise her on marijuana policy. She won the vote 13-0, with some council members, Curren Price and Paul Koretz, absent from the meeting. Packer, 26, told the council that her interest in weed policy began when she realized the disproportionate affects that the “war on drugs” and prohibition had on communities of color. The mission of the department is to protect all children, neighborhoods, marijuana businesses, and natural environments within the city’s jurisdiction. According to Packer, “It is extremely important that as this industry develops in the city of Lost Angeles, it is done with consciousness.” The city still needs to set Packer’s salary and work out budget details. The department received $789,800 this fiscal year from budget officials. It will need to cover salaries for all five members of the Cannabis Commission, as well as its development. During the same meeting, the council also approved those nominated by Garcett for these positions, which include former planning commissioner, Robert Ahn, certified accountant Philip Mercado, regional general surgery chief at Southern California Permanente Medical Group, Misty Wilks, and former member of the Police Permit Review Panel, Victor Narro. On November 16 last year, Californians voted to legalize recreational marijuana, and the state has a deadline to start issuing licenses by January 1, 2018. The new law follows twenty years of legal medical cannabis use. Back in March, the city of Los Angeles approved a ballot measure that added a few updates to its marijuana policy. That ballot measure provided the city with a larger revenue stream by setting new tax rates for the weed industry. Ron Galperin, City Controller, estimates that it could generate at least $50 million next year in tax collections for the city. Indeed, economic estimates of both the medical and recreational markets citywide could be as high as $700 million. On Tuesday night, the city held a council meeting. There, council members heard input on the new legalization-related regulatory rules, which include stipulations for where weed shops will be able to operate. According to City Council President, Herb Wesson, these draft regulations, which first came under discussion in June, are continually evolving. disproportionate affects that the “war on drugs” and prohibition had on communities of color. Economic estimates of both the medical and recreational markets citywide could be as high as $700 million. The amount is high..